PHILADELPHIA (WPVI) -- You are a Philadelphia Eagles fan. You are ready to cheer on the Birds in Super Bowl LII. But what makes this team so special? Yes, there are the stats, the records, and the NFC Championship. But there's so much more. Coincidentally, there are at least 52 reasons to cheer on the Eagles in Super Bowl LII. 1. Underdog Mentality. The Eagles are going in with the odds against them - just the way they like it. 2. Using Advice From Past Stars. It doesn't hurt to get some insight from guys who have been there before including Drew Brees, Joe Flacco, and Brett Favre. Joe Flacco shares his Super Bowl advice. Jeff Skversky reports during Action News Mornings on January 28, 2018. 3. Retribution. 13 years ago, Tom Brady stopped the Eagles from walking out of the Super Bowl as champions. They are looking to right that wrong. 4. Family. Eagles fans are a big family. And sometimes family members like to surprise one another. 5. Making A Difference. Whether it's donating paychecks to support educational equity, their commitment to social justice, or sending t-shirt proceeds to Philadelphia schools, Eagles players have been making an impact on and off the field this season. 6. Friends In High Places. Sister Virginia, the Delaware County nun and Birds super fan, has the Eagles getting the W in Minnesota. You can watch Sister Virginia's full analysis in the video player above. 7. Ex-Patriot X Factor. Chris Long has been to the Big Game before, last year winning it all with the Patriots. "Hopefully he respects his elders a little bit out there," Brady said with a smile. Tom Brady said Tuesday that he hopes former teammate Chris Long "respects his elders a bit" and doesn't hit Brady too hard if he gets a shot in Super Bowl LII. 8. Brotherly Love. Whether it's the Phillies, Flyers, Union, or 76ers, all Philly sports teams are showing their support behind the Eagles. 9. Multi-Million Team. A bettor placed a "multimillion-dollar" bet on the underdog Eagles in Las Vegas, according to MGM vice president of race and sports Jay Rood. 10. Toddler's Take. When 2-year-old Lachlan practiced his Eagles Fight Song before taking his nap, it was no question that fans all of ages will be backing the Birds on Sunday. Watch the report from Action News at 4:30 p.m. on January 29, 2018. 11. Playing with Emotion. "I know she's going to grow up and I want her to be proud of her daddy." Nick Foles says it's all about making his daughter proud. 12. 16-Time Champ Sings Along. WWE Superstar John Cena, who is from New England, became an Eagles fan during his stop in Philadelphia. He led a Wells Fargo crowd into a rousing rendition of the Eagles Fight Song. 13. Next Man Up. When Carson Wentz went down for injury, the Eagles QB expressed confidence in Nick Foles. "I have the utmost confidence in Nick and the coaching staff that they will step up. We have been plagued with injuries all year long. It's just been the next-man-up mentality and that's going to continue. That's just going to continue." 14. Long Road to Victory. Nick Foles took quite the winding road to get to the Super Bowl and is focused on winning. Crazy story of how Foles, Keenum got to NFC Championship Game. Ducis Rodgers reports during Action News Mornings on January 21, 2018. 15. Keeping It Light. With the biggest game of their lives growing closer, the players are still able to have a fun time. Beau Allen interviews Jason Kelce and vice versa during Super Bowl Opening Night on January 29, 2018. 16. Hungry Fans. Eagles fans are hungry for a championship, but they are also hungry for Eagles-related food. 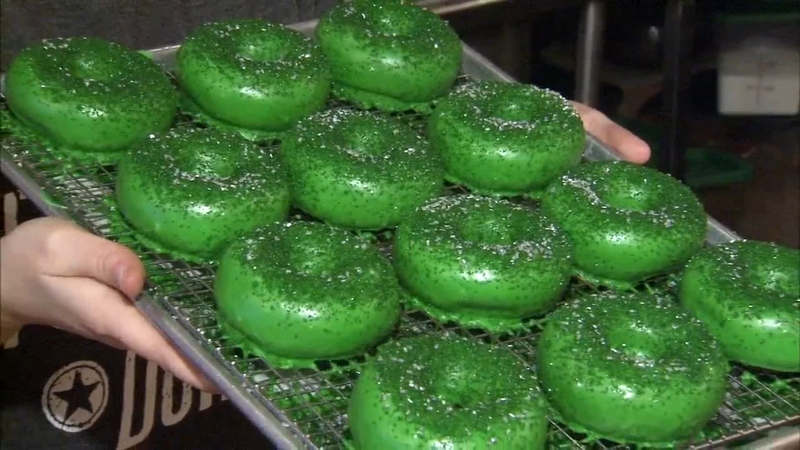 Grabbing a donut and coffee these days will not only show off your Philadelphia Eagles pride, but it will benefit a good cause. 17. Dancing Lurie. Every Eagles victory comes with a chance of a Jeffrey Lurie locker room dance. 18. Fresh Poetry. West Philadelphia's Will Smith wrote a nice rhyme for the Philadelphia Eagles. HAHAHA... PHILLY IS IN THE BUILDING!" 19. Think Pink. Doylestown's own Pink will be singing the National Anthem and will be sending good vibes to the team, whether she can believe it or not! 20. City All Aglow. 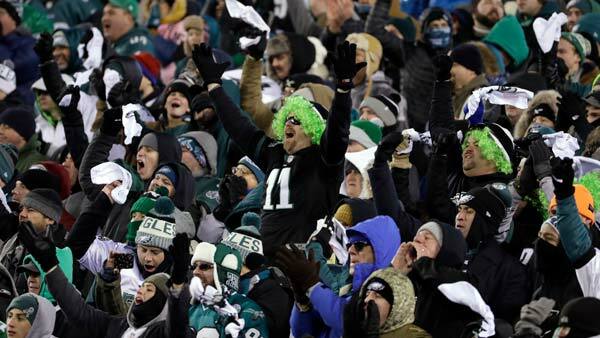 The Eagles' rise to the top isn't the only thing that has brightened the spirits of fans, green lights all of over the city are doing that, too. 21. Have Our Cake & Eat It Too. Eagles fans are so hungry for a championship, they won't let an opportunity pass to show their support - including at their wedding. Local bakery creates Eagles wedding cake. Matt O'Donnell reports during Action News Mornings on January 30, 2018. 22. Millville Believes. Even though he's not on the Phillies, maybe one day, Millville native Mike Trout never stopped believing in his Eagles. 23. Crisco Cops. Only Philadelphia can say we had the Crisco Cops as part of our postseason festivities. 24. Rocky Approved. Sylvester Stallone delivered a message for all Eagles fans: "Keep punching, Philly!" 25. No Billy Penn Curse. Unlike previous playoff runs, Philly will not be messing with the Billy Penn statue atop City Hall. Right, Mayor Kenney? Kenney: I'm not jinxing anything. Matt O'Donnell reports during Action News Mornings on February 1, 2018. 26. Ask Alexa. For whatever reason, Amazon's Alexa is an Eagles fan. We are not complaining. And we don't mind her thoughts on the Patriots, either. Alexa sticking with the Eagles to win Super Bowl. 27. The Ertzes. U.S. women's soccer star Julie Ertz was on the opposite side of the country, playing a game in San Diego, California, when she found out her husband, Zach Ertz, was going to the Super Bowl. Her reaction went viral and showed how much this means not only to Eagles fans, but players' families, too. Reunited! Julie and Zach Ertz will be together for Super Bowl. Sarah Bloomquist reports during Action News at Noonon January 31, 2018. 28. California Dreamin'. The Lower Merion High School star and former Los Angeles Laker Kobe Bryant is believing in the Birds from the West Coast. 29. Hype Videos. The Philadelphia Eagles are masters at hyping up the crowd during the game. Their video editors aren't too bad at getting the crowd hyped prior to the game. 30. Fight Song. You know it by heart by now. But it never gets old. Fly Eagles Fly. 31. Sitcom Supremacy. One of the top shows in the country is ABC's 'The Goldbergs.' Just as crazy as they are for the Eagles of 1980-something, we are for the Eagles of today. 32. Green Goblin. From his green hair, which has led many to sport the same style, to this moment with a fan, Jalen Mills bleeds Eagles green. 33. Something's Brewing. You can sense something is brewing. Something big. It may have to do with the free coffee Wawa is giving out on Super Bowl Sunday. 34. Brady Gets It. 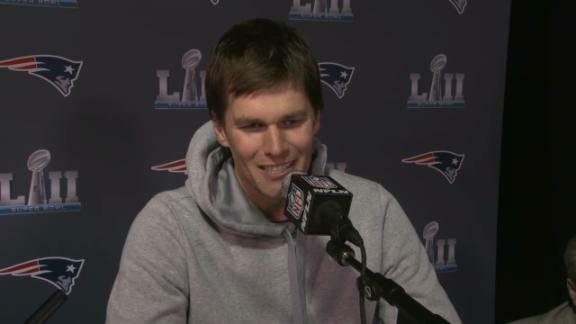 Even Tom Brady understands the Philadelphia Eagles and their fans are to be taken seriously. " They got, obviously, a great coach and very, very determined, hardnosed players and a very great organization. A great fan base." 35. Wagers, Wagers, Wagers. The friendly wagers continue between businesses, groups, and companies in Philly and Boston - from the Philadelphia Zoo and Zoo New England's waging the rights to name the next born goat kid, to the Philadelphia Orchestra and Boston Symphony, to the Philadelphia Museum of Art's competition with the Boston Museum of Fine Arts, there's a wager happening on almost every corner of the two cities. Friendly wagers from Philly to Minneapolis. Jeannette Reyes reports during Action News Mornings on January 31, 2018. 36. We All Scream For Ice Cream. Doug Pederson likes to end team meetings by telling his players to go "eat ice cream." Why? Simple, because he loves ice cream! 37. Eagles Fan At Birth. Action News met a Chester County family whose latest addition is named after the Eagles quarterback, Carson Wentz! Baby girl named after Carson Wentz. Gray Hall reports during Action News at 6 a.m. on January 20, 2018. 38. Late Night Laughs. Jimmy Kimmel Live's Guillermo caught Eagles fever when Action News' Sarah Bloomquist taught him the Eagles chant. 39. Good Morning, Eagles Fans! When Robin Roberts took an impromptu poll about who will win the Super Bowl, the Good Morning America audience was quite clear on their choice. GMA studio audience strongly behind Eagles. Video from January 30, 2018. 40. Wearing Eagles Pride. Whether it's the green hair or painting Eagles jerseys on their nails, fans are making sure everyone knows that they are backing the Birds. Fans adorn fashions showing Eagles pride. Gray Hall reports during Action News at 5 p.m. on January 25, 2018. 41. Billboards Say It All. 42. Kelly Ripa Represents. The 'Live with Kelly and Ryan' cohost from New Jersey continues to show her support for her home team, even wearing green shoes. And the Eagles fans in attendance love it! Eagles chant breaks out at Live with Kelly and Ryan on February 1, 2018. 43. Tattoo To Remember. This past summer, defensive end Chris Long jokingly told linebackers coach Ken Flajole he would get a tattoo of his face should the Eagles win it all. That would be quite a sight to see. 44. Birds Know Birds. Not all Eagles fans are human. 45. Philly Philly! During open practice before the season began, Lane Johnson said if the Eagles win the Super Bowl, he'd buy beer for everyone. Bud Light stepped in and said they'd throw a party. 46. The Jay Train. Jimmy Kimmel Live's Guillermo may have trouble pronouncing running back Jay Ajayi's name, but Eagles fans have no trouble saying the London-native's name. If the Eagles win, he will become the fifth British-born player to claim a Super Bowl victory. Guillermo stumps Eagles at Super Bowl Opening Night. Tamala Edwards reports during Action News Mornings on February 1, 2018. 47. Eagles Fans, Hear Them Roar. Eagles fans can be loud. And they were definitely that during the NFC Championship Game. Perhaps the Birds in Minnesota will be able to hear us from Philly. 48. Home Sweet Home. Eagles defensive tackle Beau Allen is back home to play in the Super Bowl. He's hoping to win it all not too far from where his childhood dream began. "You can't script this," his mother told Action News. Eagles player Beau Allen returns home for Super Bowl. Sarah Bloomquist reports during Action News at 12 p.m. on February 1, 2018. 49. Name Game. The Museum of the American Revolution changed their Patriots Gallery to Eagles Gallery. And a number of Boston Markets in the area have become Philly Markets. 50. Birthday Present. Head coach Doug Pederson celebrated his 50th birthday just days before leading his team into Super Bowl LII. Wonder what he would like for a belated gift? 51. Underdog Masks. As soon as Lane Johnson and Chris Long donned their German shepherd masks, a craze was started. Local stores and online shops quickly sold out of the underdog masks. How many will we see at U.S. Bank Stadium?